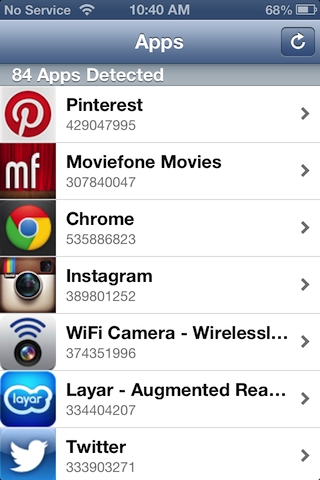 The iHasApp iOS Framework allows you to detect installed apps on a user's device. Detection results can be in the form of an array of detected appIds, or an array of appDictionaries from the iTunes Search API. Add the iHasApp subfolder to your project and ensure that it is linked to the project target. Add #import "iHasApp.h" to the classes in which you wish to access iHasApp. Initialize and begin detection methods. The iHasApp framework utilizes only public, documented, and non-deprecated APIs. It is completely App Store safe. There are already a number of approved apps on the App Store that have integrated iHasApp. Like all things, it is always a prudent idea to either ask your users' permission or to include a clause in your EULA. This framework comes with an example application that demonstrates detection initialization and information display. The iHasAppExample project uses Olivier Poitrey's SDWebImage project to asynchronously display the app icons. The iHasApp.h header file is structurally commented. If you would like to see the Appledoc representation, visit the iHasApp Documentation.